Nine Micron Inc provides regularly scheduled fiber optic training in Calgary. Nine Micron Inc Is Western Canada’s only FOA approved mobile fiber optic school. We are recognized by the Fiber Optic Association – School #311. We have been in business since 2009. Our passion is to give you knowledge, skills and confidence so that you can hit the ground running. We focus on your priorities so that you succeed. We train you how to install fiber optic cabling, connectors and equipment. We train you how to design a fiber optic system. 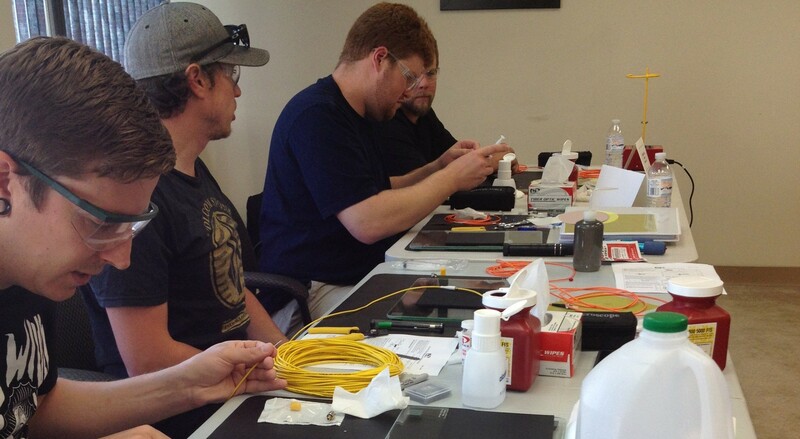 We train you how to test, troubleshoot and repair fiber optic systems. We train you how to document your work. We will provide training at your location. We consult with you to develop a successful system design. We maintain small class sizes (maximum of six students) to allow us to give one-on-one mentoring of each student. We will come and teach your crew at your location – wherever you are! We provide regularly scheduled classes in Calgary. We can provide you will all the fiber optic tools, test equipment and supplies that you need to get the job done. We can provide you with onsite coaching for your new team of Certified Fiber Optic Technicians.